The world economy can appear to be operating quite well but can be hiding a major problem that causes it to be fragile. 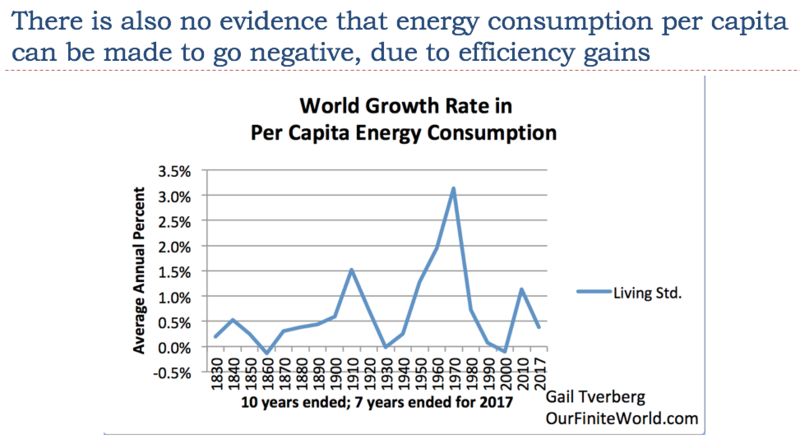 My presentation The World’s Fragile Economic Condition (PDF) explains why we should expect financial problems if energy consumption stops growing sufficiently rapidly. In fact, a global sell off in the equity markets, such as we have started to see recently, is one of the kinds of energy-related impacts we would expect. This is Part 2 of a two-part write up of the presentation. In Part 1 (The World’s Fragile Economic Condition – Part 1), I explained that a large portion of the story that we usually hear about how the world economy operates and the role energy plays is not really correct. I explained that the world economy is a self-organized system that depends upon energy growth to support its own growth. In fact, there seems to be a dose-response. The faster energy consumption grows, the faster the world economy seems to grow. The period with fastest growth occurred between 1940 and 1980. During this period, interest rates were rising and workers saw their wages increase as fast as, or faster than, inflation. 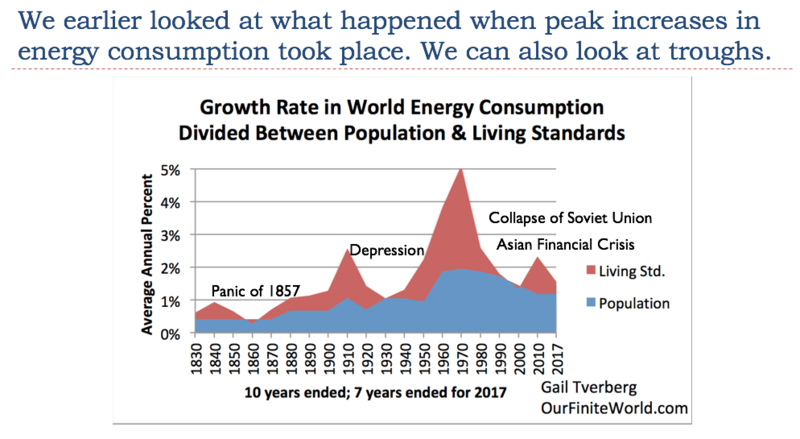 After 1980, the rate of growth in energy consumption fell, and the world needed to tackle its growth problems with a different approach, namely growing debt. In this post, I explain how debt (and its partner, the sale of shares of stock) help pull the economy forward. With these types of financing, investment in new production becomes almost effortless as long as the return on investment stays high enough to repay debt with interest and to repay shareholders adequately. At some point, however, diminishing returns sets in because the most productive investments are made first. The way diminishing returns plays out in energy extraction is by raising the cost of producing energy products. In order for the sales prices of energy products to rise to match the rising cost of production, rising demand is needed to give an upward “tug” on sales prices. This rising demand is normally produced by adding increasing amounts of debt at ever-lower interest rates. At some point, the debt bubble created in this manner becomes overstretched. We seem to be reaching that point now, especially in vulnerable parts of the world economy. 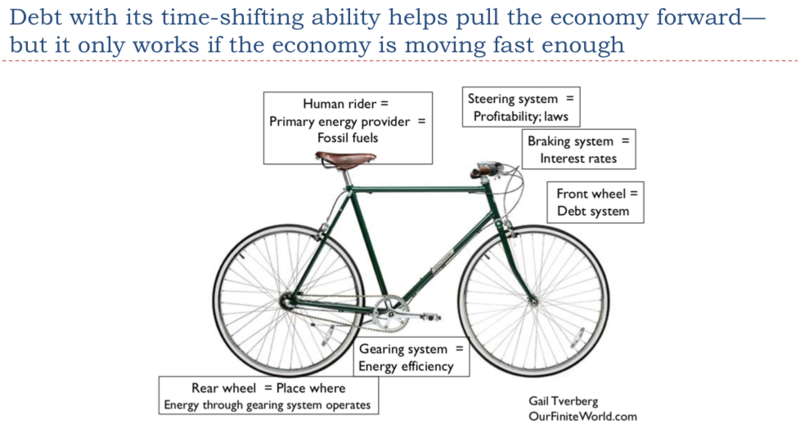 Let’s first look at a slide from Part 1, explaining the way in which the economy works like a giant factory. As long as energy products are very inexpensive, it is possible for the economy to expand very rapidly. 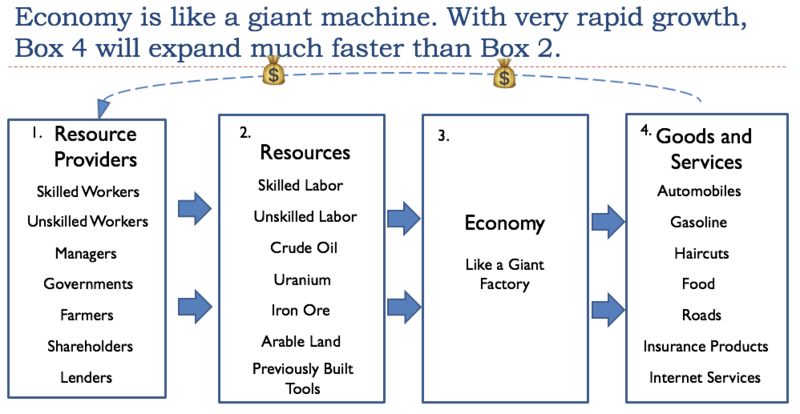 When this happens, the Goods and Services produced in Box 4 are able to grow so rapidly that all of the Resource Providers in Box 1 can be well compensated, simply by using a quasi-barter arrangement, facilitated by the use of money. With this approach, Resource Providers can get adequately paid using the Goods and Services produced in close to the same time period. Something of this nature occurred prior to 1970, when inflation-adjusted oil prices were less than $20 per barrel (Part 1, Slide 26). 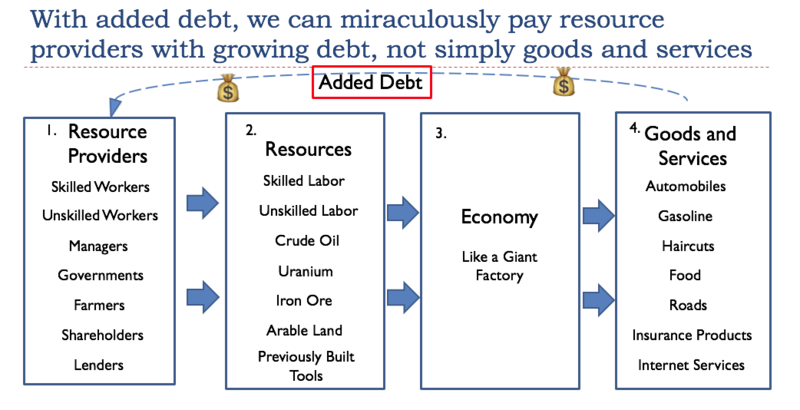 If the growth of the economy slows, so that not enough Goods and Services are being created by the economy to use this approach, it is possible to work around the problem by adding debt. 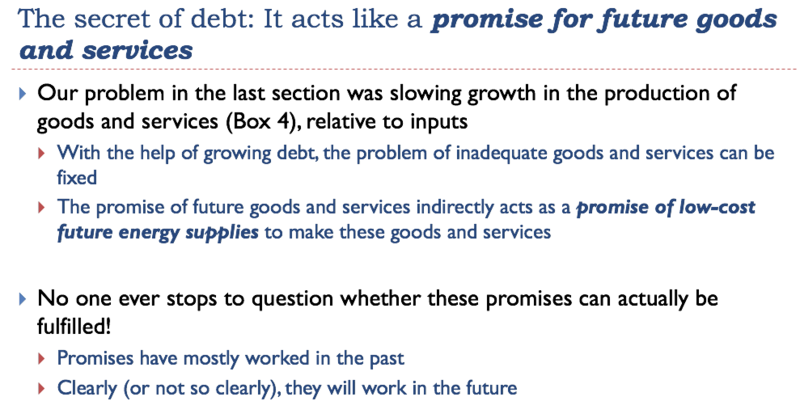 Adding debt makes it possible to substitute promised future Goods and Services for already produced Goods and Services. 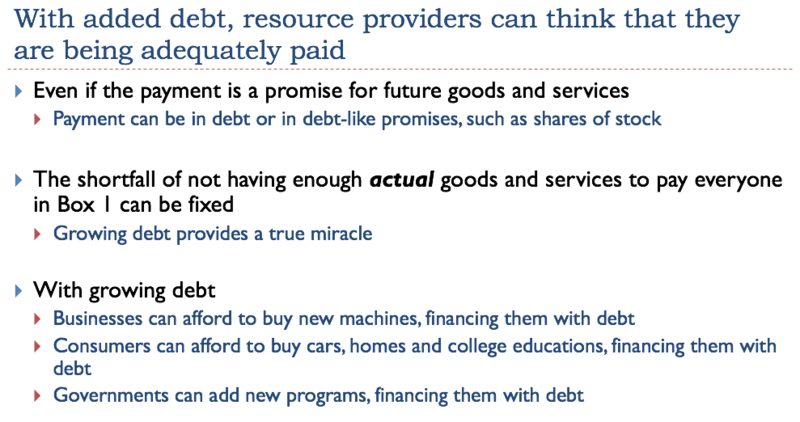 Added debt makes it seem like more goods and services are available to pay resource providers. Selling shares of stock acts very much like debt, because the funds provided by these shares also provide access to goods and services that others have already produced. In the case of the sale of shares of stock, the promises are for future dividends, capital appreciation, and partial ownership of the company. Growing debt looks like it can solve all problems! No wonder that Keynesian economists found it so useful. But the return must remain high enough to repay debt with interest. Borrowing money generally comes with the requirement that the amount borrowed be repaid with interest. If the energy purchased using debt allows the economy to grow fast enough, there is no difficulty in repaying debt with interest. If energy is very inexpensive (equivalent to oil cost less than $20 per barrel in inflation-adjusted price), this payback system generally works because a large amount of energy can be purchased for a small quantity of debt. If the price of the energy rises, much more debt is required for the same amount of energy produced. For example, if oil is $80 per barrel, the affordability is much lower. It takes four times as much debt to pay for a barrel of oil. Repayment of debt with interest becomes more difficult. In Part 1, we observed that US long-term interest rates have been falling almost continuously since 1981. This situation of falling interest rates led to falling mortgage payments for a given amount borrowed. Because of the lower monthly payments, homes became more affordable; in other words, there tended to be more potential buyers for homes at a given price level. Indirectly, the increased affordability of home ownership tended to raise the resale value of homes. It also encouraged the building of additional homes. Building homes indirectly requires the use of many different types of commodities. Metals are used in pipes and in wiring. Wood is used for framing. Concrete is often used for the basement. Oil is needed to haul these goods to the site where the home is to be built. Thus, indirectly, falling interest rates tend to raise commodity prices. Many assets are purchased with debt. If interest rates are very low, purchasing these assets becomes more affordable. The sale of shares of stock provides another way of raising capital for a company. 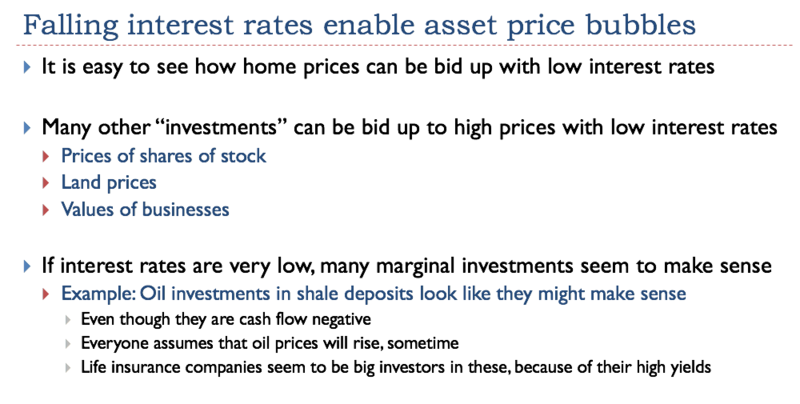 In the case of oil-producing companies, the purchasers of shares of stock often think, “If extraction costs are rising, surely oil prices and other energy prices will rise as well.” This belief allows the price of shares of stock to be bid up to a high level. When asset prices rise, economists sometimes refer to the wealth effect. 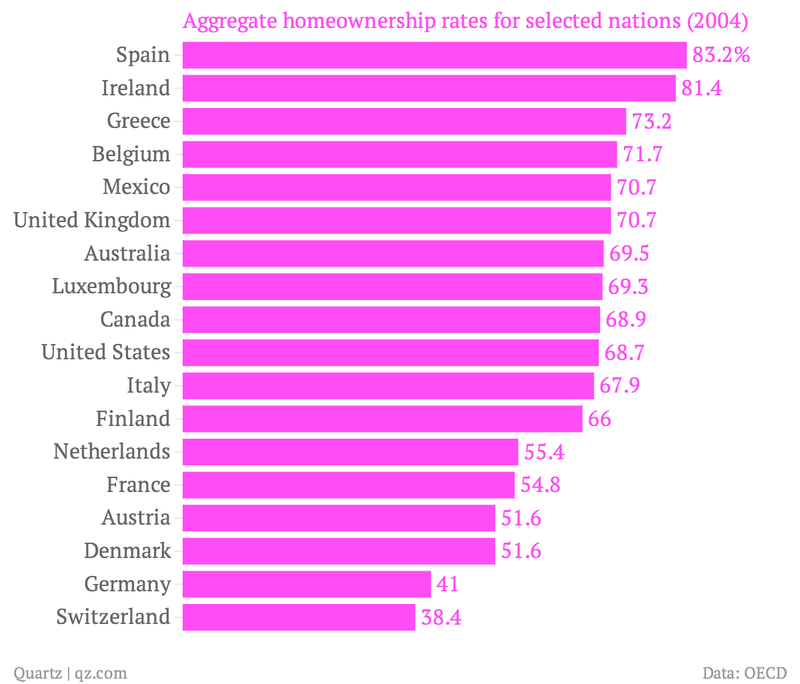 Homeowners feel richer if their homes are worth more, and they can borrow more against them. Owners of shares of stock feel richer if their shares of stock have higher values. Owners of pension plans are happy when stock prices are high, because it looks as if these shares can be sold, allowing the plans to meet their pension obligations. If the debt bubble stops growing, then the commodity price bubble cannot continue to grow. In fact, it may abruptly pop. This is what happened in the second half of 2008, when oil prices dropped precipitously, from $147 per barrel to the low $30s. Government pension plans such as Social Security are not treated as debt because they are not guaranteed, but they act in much the same way as debt. 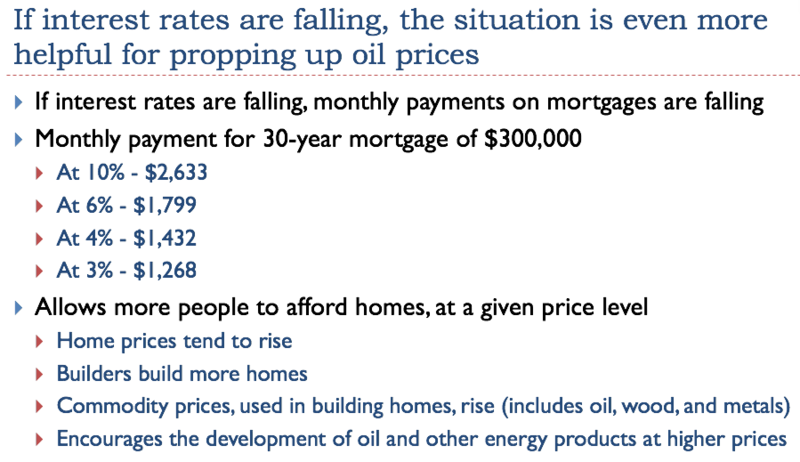 The huge interest rate spike to 18% in 1981 on Slide 43 corresponds with the big drop in oil prices on Slide 44. Interest rates were so high that buyers could no longer afford new homes or factories. Prices seem to have been brought down by falling demand. If we look at recent oil prices, we can also see that they also depend very much on interest rates. 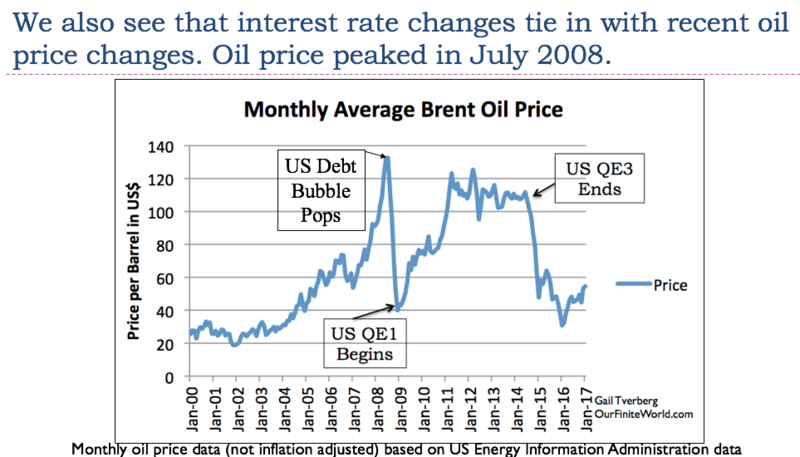 In my paper, Oil Supply Limits and the Continuing Financial Crisis, I show that the US debt bubble popped precisely when oil prices hit a peak in July 2008. That is when US consumer credit and mortgage debt started falling. 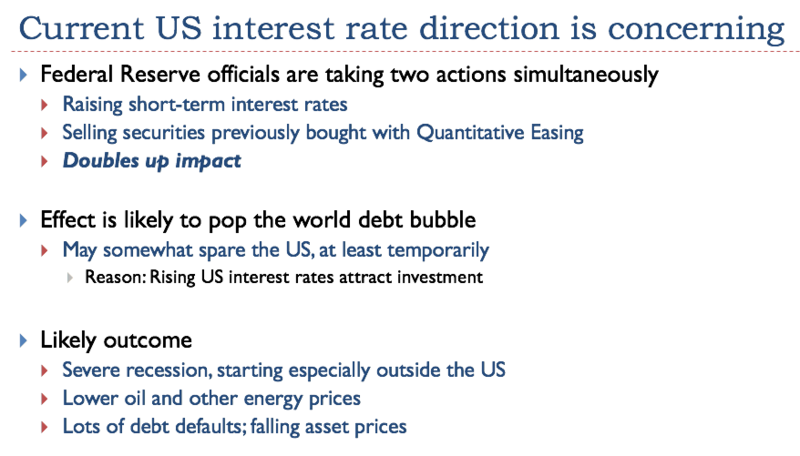 On Slide 45, QE stands for Quantitative Easing. This was a program that allowed lower long-term interest rates in addition to lower short-term interest rates. Thus, it gave the Federal Reserve (and other central banks) the power to reduce interest rates to an even greater extent than was possible by reducing short-term interest rates alone. The Federal Reserve seems to have been instrumental in causing the Great Recession, as well. 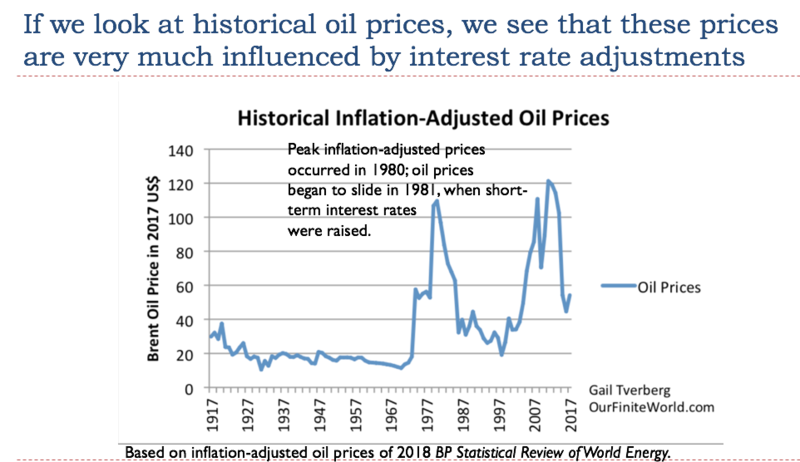 Slide 46 shows a larger scale of the same information about oil prices and short-term interest rates shown on Slide 43. There can be several years between the time interest rates are raised and the resulting recession occurs, so most people miss the role that intentionally raising short-term interest rates plays. 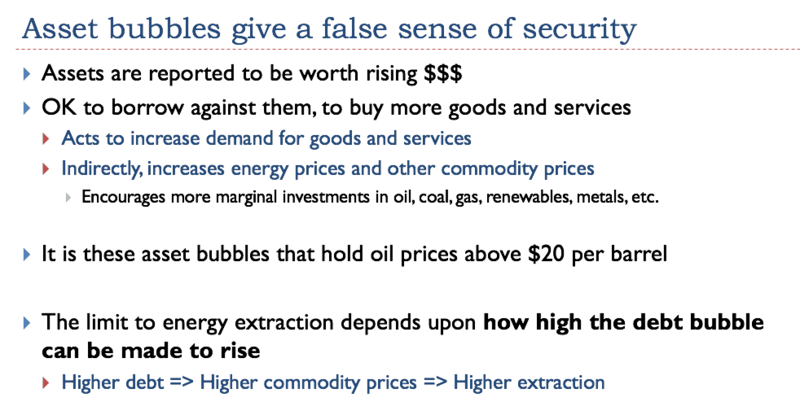 Also, high oil prices also tend to have an adverse impact on the economy because energy prices rise, but wages do not rise at the same time (Part 1, Slide 28). Consumers are forced to cut back on discretionary goods when the cost of necessities (such as the cost of commuting and the cost of food) rise. 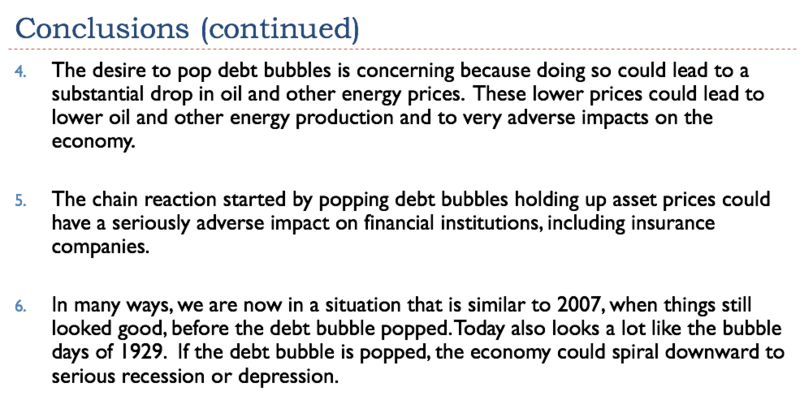 In fact, it seems to be the combination of rising energy prices and increased interest rates that leads to recessions. On this chart, I show some of the comments heard about oil prices. In mid-2008, it was clear that high oil prices were becoming a problem, especially for those with subprime mortgages who were living in homes that were distant from their work. By early 2014, we started hearing that oil prices had been too low for oil producers in 2013. Because of the unprofitability of oil production, some oil producers were cutting back on investment in new production. See my post, Beginning of the End? Oil Companies Cut Back on Spending. Now, it is fairly clear that no oil price will work for both producers and consumers. Today’s Brent oil price of about $80 per barrel is both too low for producers and too high for some consumers. Consumers who are particularly affected are those whose currencies are falling relative to the dollar, such as consumers in Turkey and Argentina. Even countries with more modest decreases, such as China and India, are cutting back on automobile purchases. This change will affect future oil demand. 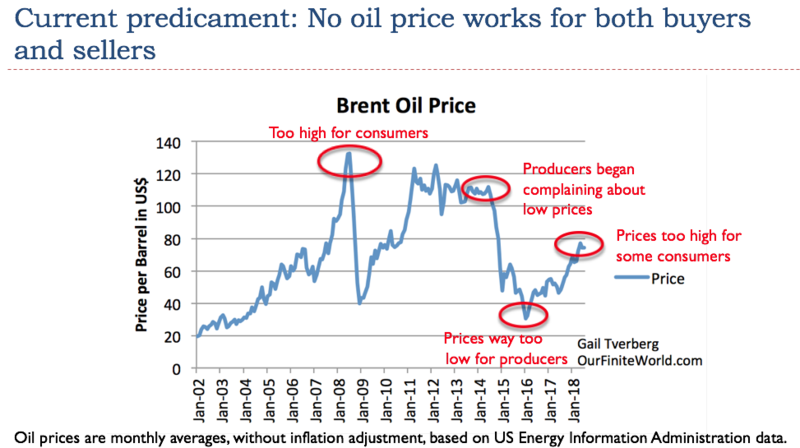 If, by some chance, oil prices should spike to a high level such as $100 per barrel, the affordability problem pretty much guarantees that oil prices will fall back fairly quickly. This issue, by itself, makes it impossible to believe that oil prices will increase endlessly. I should mention, too, that we are also at a point where no interest rate works for everyone. Those buying new homes and new cars need low interest rates, in order for these goods to be affordable. 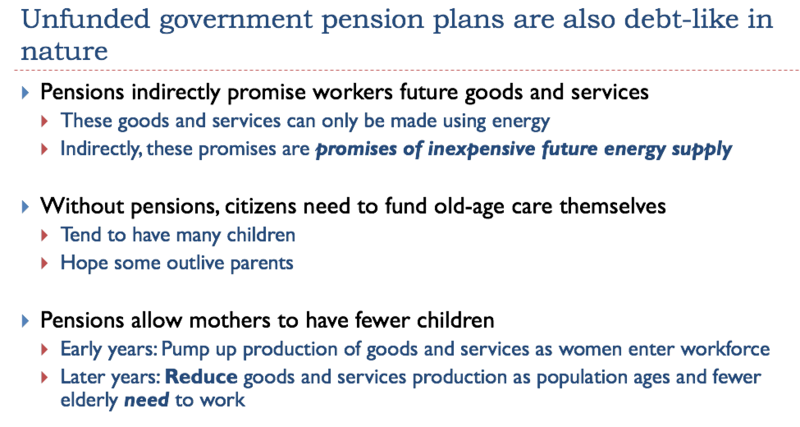 Pension plans, on the other hand, need high interest rates, in order to meet their pension promises. There is no one interest rate that works for every purpose. Thus, we have a combination problem: no interest rate works for everyone, and no set of energy prices works for everyone. 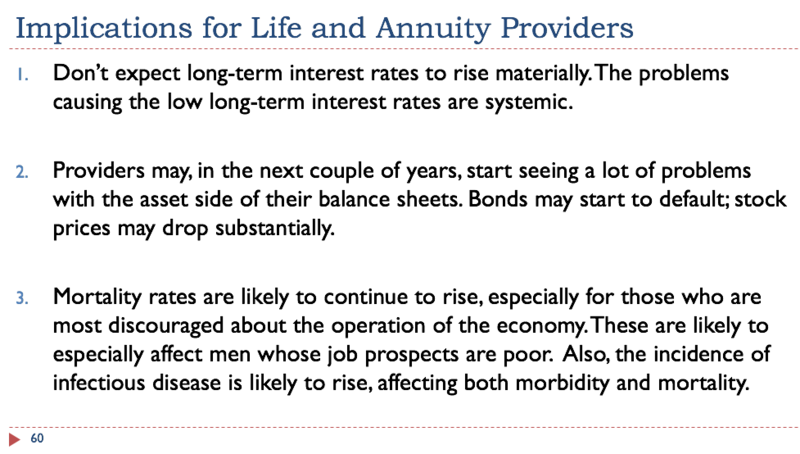 The Federal Reserve is now in the process of raising short-term interest rates (see Slide 43). It is also selling the QE securities that it previously acquired to reduce long-term interest rates. 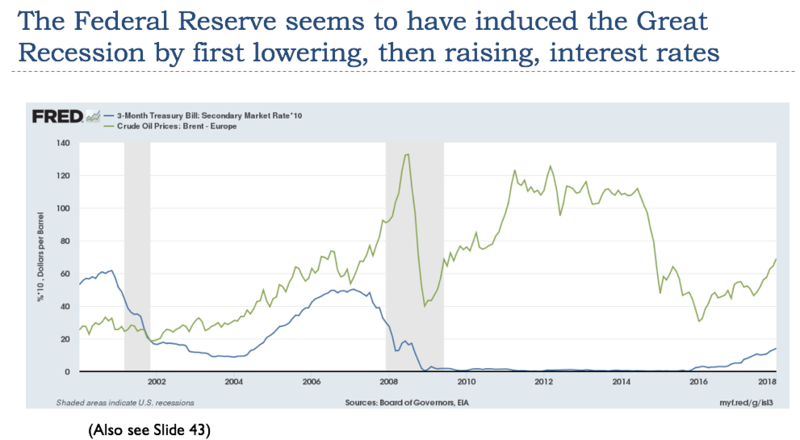 If buying these QE securities lowered long-term interest rates, selling them should raise long-term interest rates. 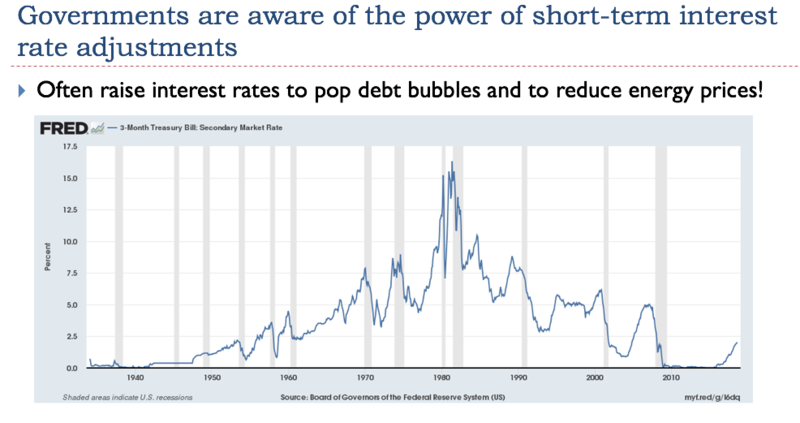 Raising both short- and long-term interest rates sounds like a formula for creating a huge number of debt defaults and lowering prices of shares of stock. It is likely that these actions will also start a major recession. On Slide 50, “earlier” refers to Slide 16 in Part 1 of this presentation. From Part 1, we remember that the first small peak refers to the California gold rush; the second larger peak about 1910 refers to “Electrification and Early Farm Mechanization.” The third peak about 1970 refers to the “Postwar Boom.” The last small peak refers to the expansion made possible by China’s growth, and the growth of other Asian countries. Slide 50 shows that the troughs refer to periods that were bubble collapses, or the collapse of the central government of the Soviet Union. Slide 51 (next) gives details with respect to these low periods. 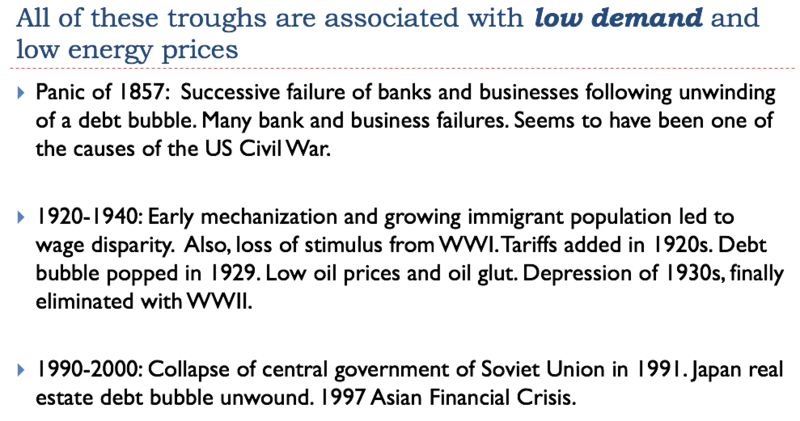 These were bad times for economies: depression, debt collapses, and periods with significant wage disparity. They were not periods with high energy prices. Clearly, none of these low periods was a good period for the economy. While we can see that there was low energy consumption during the periods, the primary reason for this low energy consumption was the collapse of a debt bubble or of a government. 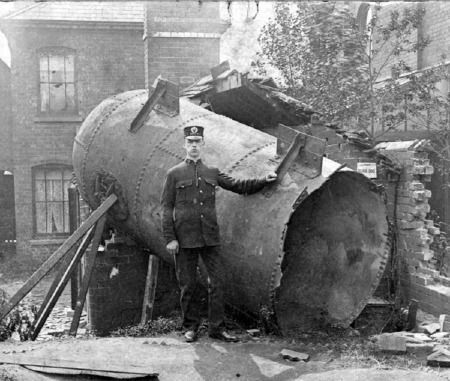 Peak coal occurred in the United Kingdom in 1913, and World War I began shortly thereafter, in 1914. When peak coal occurred, wages for workers were very low, because diminishing returns had made the operation of coal mines increasingly expensive, but those purchasing coal could not afford higher coal prices. Thus, mining companies could not afford to pay workers adequate wages. World War I gave an alternative employment opportunity for coal miners and others with low wages. Entering World War I was a very successful strategy for the UK. The fact that the UK was on the winning side allowed the UK to retain its role as the holder of the reserve currency. In this position, it was fairly easy for the UK to borrow the funds needed to obtain coal and other energy imports. 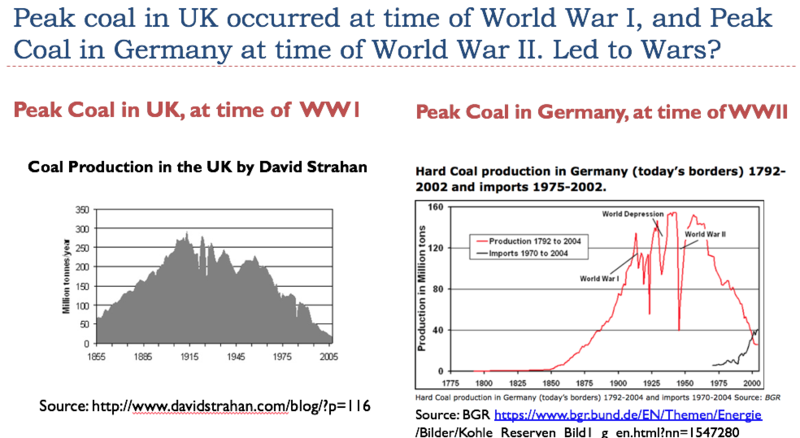 Germany seems to have encountered peak coal about the time World War II began. Was this an attempt to cover up Peak Coal? We don’t know for certain, but the timing certainly looks suspicious. In both of these cases, low energy supply seems to have led to fighting, rather than high prices. 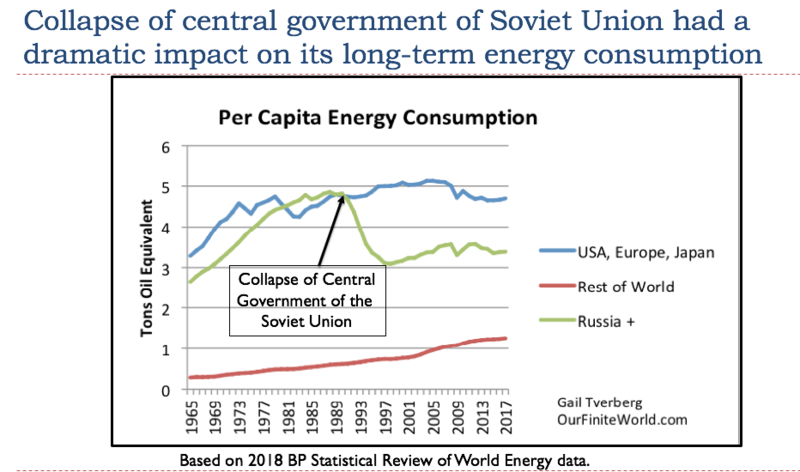 The collapse of the central government of the Soviet Union seems to have been an indirect impact of the long term low oil prices in the 1981-1991 period. The high oil prices of the 1970s had encouraged the Soviet Union to ramp up oil production. Once the US raised interest rates and oil prices fell, there were no longer funds for investing in new oil production. The Soviet Union was dependent on oil exports. It was able to continue for quite a few years with low prices, but eventually its central government collapsed. Over the long term, consumption has continued to be much lower, reflecting the permanent loss of industry. Slide 55 is a graph of the “peaks” on Slide 50. If we listen to mainstream economists (including Paul Romer and William Nordhaus, who recently received the Nobel Prize in economics), improved technology can allow the world economy to become increasingly efficient, and thus overcome the problem of diminishing returns. Slide 55 shows that over a period of nearly 200 years, this has never happened in the past. The troughs represent collapses of one kind or another. These low periods did not represent sustainable situations. The problem is that diminishing returns leads to the need for very different techniques to work around new problems. For example, if there are diminishing returns with respect to extracting fresh water from wells, the first alternative is to dig deeper wells. Efficiency gains can somewhat help offset the cost of deeper wells. But once the problem advances to the point where desalination is needed, plus remineralizing the water with the correct minerals after desalination, the cost of fresh water becomes much higher. It becomes impossible for improved technology to work around the very large increase in costs that diminishing returns seems to cause. We haven’t been able to work around diminishing returns with increased efficiency before; we are likely kidding ourselves if we think we can do so now. The point that should be emphasized is that the reason why the United States economy now looks fairly good is because we are at the top of a debt bubble. This bubble is partly the result of world’s long running low interest rates, and partly because of the United States’ recent tax cuts. Thus, the situation today is a lot like 1929 before the debt bubble collapsed, or a lot like 2007 before the economy derailed. Things look good, but they won’t necessarily stay favorable for very long. The second version of my talk was given at the 2018 Bermuda International Life and Annuity Conference, to a group of 300+ insurance executives of various kinds. This talk was called Energy Economics: Is a Discontinuity Ahead? This audience was especially interested in my talk because interest rates are central to the operation of pension plans. If interest rates do not rise, this is a major concern for this group. The third version of the presentation I gave was to a group of followers of Peak Oil theory. This presentation was somewhat shorter and slightly rearranged. The title of this presentation was How the Energy System Really Works and What Seems to Be Going Wrong. 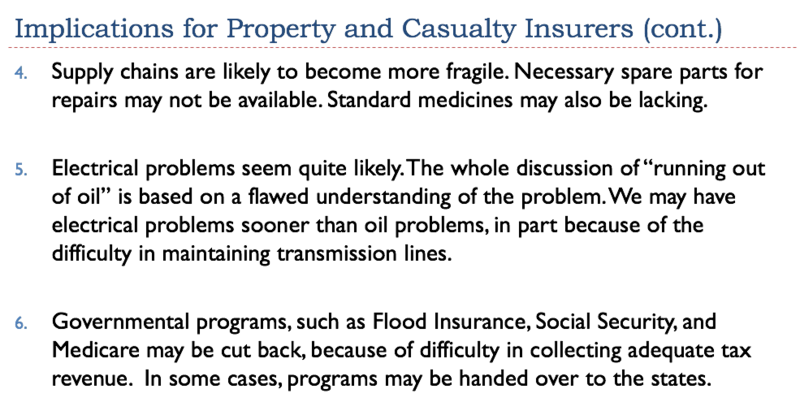 This entry was posted in Financial Implications and tagged diminishing returns, energy limits, interest rates, oil prices. Bookmark the permalink. Wow, after reading this article I would never go fishing for anything in the Gulf of Mexico. Apparently, the Deep Water Horizon wasn’t the only rig to sink. Another called the Taylor Energy Spill went down 14 years ago and it is still leaking oil. Article says it on course to become the worst oil spill in US history and it can’t be capped? Buried under too much muck? The Taylor Energy spill is largely unknown outside Louisiana because of the company’s effort to keep it secret in the hopes of protecting its reputation and proprietary information about its operations, according to a lawsuit that eventually forced the company to reveal its cleanup plan. The spill was hidden for six years before environmental watchdog groups stumbled on oil slicks while monitoring the BP Deepwater Horizon disaster a few miles north of the Taylor site in 2010. I wouldn’t even live there let alone go fishing. Had no idea the entire gulf is one gigantic industrial zone and wow if Trump gets his wish the entire Atlantic Ocean is going to see industrialization? Did you know that naturally occurring oil seeps from the seafloor are the largest source of oil entering the world ocean? In fact, they account for nearly half of the oil released into the ocean environment every year. Seeps occur when crude oil leaks from fractures in the seafloor or rises up through seafloor sediments, in much the same way that a freshwater spring brings water to the surface. . . . When an oil spill occurs in an area with many naturally occurring seeps, responders may have a hard time telling the difference between spilled oil and seep oil. Plastic eating microbes to the rescue. Hopefully, evolution will eventually clean up all the plastic we leave behind after we are gone. 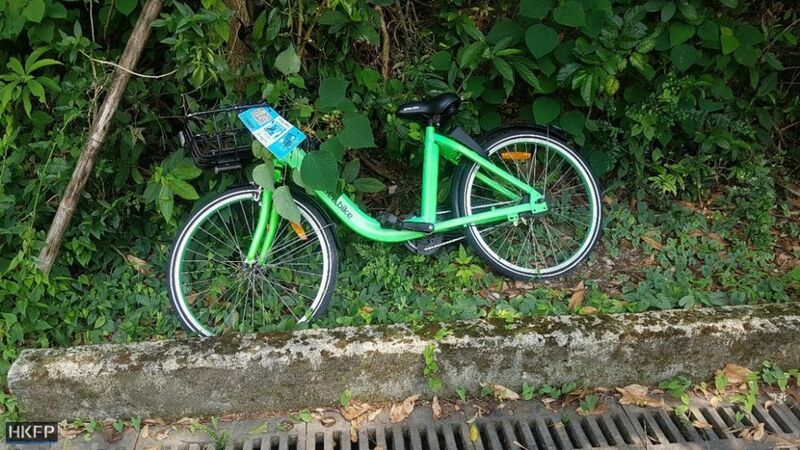 Bicycles left piled on top of one another or blocking paths, poor cycling etiquette, theft and vandalism have dogged Hong Kong’s bike rental start-ups – the latest addition to the city’s nascent sharing economy – over the past 12 months. The problems are nothing new, having been seen with bike rental start-ups in China, many of which have gone out of business. According to the Transport Ministry, by February this year more than 20 had failed. Among the casualties was Wukong Bicycle in the western metropolis of Chongqing, which folded in June last year amid reports that 90 per cent of its 1,200 bikes had gone missing. Now the Hong Kong market looks ready for a shake-out of its own. Hong Kong-based GoBee Bike pioneered the concept in the city when it launched in early 2017. Little more than a year later, there are six start-ups renting out bicycles in Hong Kong, all of them competing for business in the city’s New Territories – an area much more rural than Hong Kong Island and Kowloon. Between them they have put more than 17,000 shared bikes on the roads. The Hong Kong operations of GoBee, which already this year has announced a withdrawal from France and Italy after large-scale theft and vandalism of its bikes, will reportedly be taken over by Ofo, the Beijing-based bicycle rental company that entered the Hong Kong market last December. The two are the biggest players in Hong Kong, controlling 10,000 bikes between them. One wonders if the competitors are hiring bikes and dumping them in the ocean…. I expect that at least part of the problem is customers riding the bicycles downhill, with far fewer customers wanting to ride them back uphill again. I know that in the US, bike sharing companies have to provide trucks to bring bicycles back from the bottoms of hills, to the tops of hills again. That is too funny. People just don’t realize how much heavy lifting fossil fuels do until you have to push, pedal or pull your way along manually. I was told the other day I should trade in my mountain bike for an electric one…. at first I was insulted …. do I look like one of those old f789s who have given up and prance about on electric bikes???? Oh no – they are not for old people — they are for going up the hill more easily so you can come thundering down the other side…. I bought an electric bike for the Musses a few years back, and it certainly makes a big difference going up hill, but it’s heavy. I wouldn’t want to be pushing it if it developed a flat tire. I tried it out on a 35km round trip with lots of ups and downs and I found that overall, my trusty 30-year-old thigh- and calf-powered lightweight aluminum-framed mountain bike performed significantly better. But more than that, I look a good deal less dorky riding the mountain bike. If you need powered-wheels and you don’t mind annoying the neighbors, there’s nothing quite like a Vincent Black Shadow. Bike-sharing, in the city and abroad, is notorious for causing social problems as users haphazardly park the vehicles anywhere they wish. The bicycles have also become targets for vandals and thieves, with some found abandoned in river beds or with their parts stolen. In August last year, the Hong Kong start-up successfully raised US$9 million to strengthen its technology, research and development, as well as to fund its global expansion. “We have spent the money, mostly on buying new bicycles,” Cohen said. But this February, Gobee.bike ended its operations in France and Italy, also citing the high cost of maintenance. Most likely an investor scam. Unless it is easy (requires zero effort) and convenient people just are not going to accept it. Most folks will not walk or ride a bike. They are lazy. You have to figure out how to profit off of laziness. Here are some excellent example of how to profit off of laziness: MSM, TV, video games, junk food, FaceBook, Twitter and InstaDoom. And let’s not forget Bitcoin …. who wants to actually study and work hard in order to be successful… f789 that…. afterall, not everyone can be Paris or Kim…. Does he mention the Fast Eddy Spent Fuel Hypothesis? I notice that Bardi’s energy model, as well as the models he refers to (World3 and the HANDY model) do not incorporate debt, and the need to repay debt with interest. The inability to repay debt with interest is one of the first limits that is hit. Another early limit is need for governments (and/or large businesses) to take an increasing share of the goods and services produced, leaving less for the impoverished workers. Debt is a promise of future energy consumption, used to fund current investments. Governmental use is an allocation of the output of the system. While the physics approach “works,” it doesn’t give much insight as to what goes wrong in real world situations. I have brought this up several times over the years, with different people associated with the modeling. I seem to get the equivalent of blank stares. 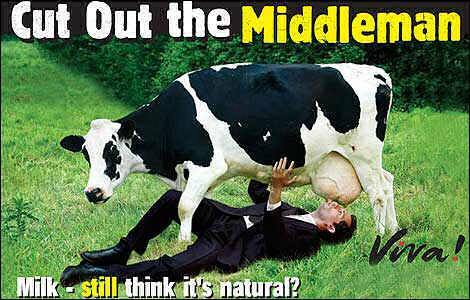 The dairy industry has been mostly silent recently. Similar stuff going on in Norway, the national dairy co-op is basically running the agencies for national nutrional advice. I enjoy dairy products but it’s really obvious that the facts are not neutral. Having grown up in Wisconsin–the “Dairy State”–I got a double dose of this stuff. My mother drank an incredible amount of milk and developed severe osteoporosis, regardless. Veggies are superior compared with milk when it comes to the calcium content. “One Size Fits Germany” Math Impossibility, Get Your Money Out of Italy Now! The Euro is 11% undervalued in Germany, the largest Eurozone economy. The Euro is 9% overvalued in Italy, the third largest Eurozone economy. The normal way central banks make adjustments to fix over-valued or undervalued situation is through interest rate policy or direct currency intervention. No matter which the ECB does, it will impact Italy and Germany in opposite directions. Meanwhile, interest rates are on the verge of spiraling out of control in Italy. Germany’s companies get a huge benefit from this, in terms of being able to sell their goods cheaply in world markets, or to countries like Italy. Recall when Burlusconi made noises some years ago … overnight he was gone…. the owners of the Fed did that…. I suppose there could be a coup … but that’s risky …. violence could erupt over … and that would not be good for an already very weak economy … locking things down a la Egypt… would no doubt accelerate Italy’s death spiral. But how to relieve the pressure that is building???? Back down and give Italy what they want? 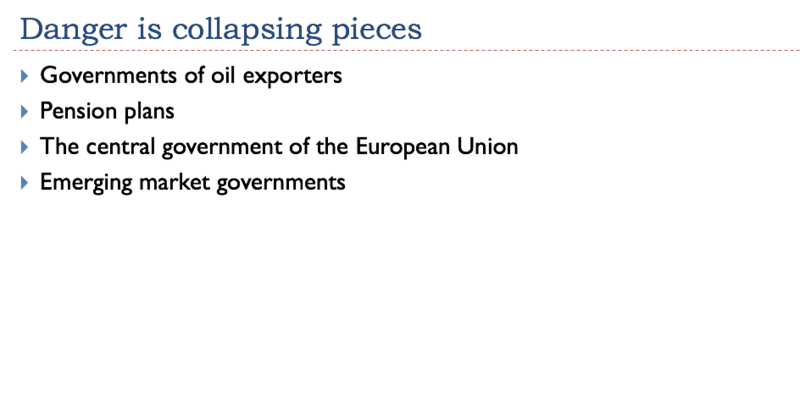 But then every other country in trouble sees that and we get epic moral hazard…. “Stock markets don’t always correlate well with what’s going on in the economy, but a largely lacklustre showing this year may well be sending out warning pulses. “In the week ending 11th October, the best of the world’s major markets, the US S&P index, fell by nearly 7 per cent. Most of this happened in two days, marking one of the most volatile periods in the index’s 90-year history. Other markets reacted in similar fashion, but consider that while the S&P is still up 3.5 per cent this year, the FTSE 100 is down over 8 per cent, the 600 firms in the broad Eurostoxx index are down 7 per cent, the Nikkei is off 1 per cent, and the Chinese Shanghai Composite index is already in a bear market, having fallen 24 per cent. Markets have been skittish indeed. “As this global expansion gets ever longer — and if America’s keeps going until June next year, it’ll be the longest since records began in 1854 — the IMF is worried about the financial consequences, in combination with rising oil prices, a concentration of debt risks, especially in China, and, inevitably, the politics of trade conflict. “Brent oil at around $80 a barrel is at its highest level since 2014, and up 17.5 per cent since January. Global demand is firm, but supply constraints are tightening the market… Some market watchers think prices could top $100 next year. One thing that has led every global downturn for the last 40 years has been a trend of rising oil prices. “Total non-financial debt in countries with systemically important financial sectors now stands at $167 trillion, or over 250 per cent of aggregate GDP, up $54 trillion and 40 per cent of GDP since 2008. The US stock market seems to be down today, as well. The Dow was at -448 when I looked. The problem is not enough goods and services being produced by the economy, with its resources. More debt and higher minimum wages don’t really fix this problem. I thought this might happen. The countries surrounding Venezuela are not doing good either. So, migrating there is not a really viable option. This is starting to happen now on a global scale. This is a global collapse which is unlike any collapse in human history. The US isn’t doing very well either so we don’t want migrants. Europe is in the same boat too. Just no where for these people to go. When you have to emmigrate to colder areas, you need to socialize around the fire. When the winter comes, you have to contribute to the existence of the fire. The cold is a great socializing incentive. That is why a bottle of alcohol attracts the people in cold areas in a similar way. The cold climate is the reason why the migration to cold countries can be sustained only with the use of subsidies like high social benefits. When these are not present, the inflow of migrants stop, as they are often not adapted to living in cold areas. I am always amazed at how much more energy countries in cold climates use than those in warm climates. Early hunter-gatherers in Africa only needed a little fuel to cook some of their food. They perhaps burned down some forests, to get at some game, and to encourage the kind of regrowth that they wanted to find a good supply of plant food. Modern people in Africa don’t need a whole lot more, especially if they live in simple huts, without electricity and walk for transportation. But people in cold climates need to keep warm in winter. It was an easy step to add industrialization as well, especially when people discovered that coal could be transported a lot more efficiently than wood, and didn’t deplete nearly as quickly. I don’t think it’s ‘surprise’ at the difference in energy use that’s the problem. I think it’s an unawareness of that use, of the reason why/how levels of civilised existence have to do that increasing energy grab the farther north they go. I see it as being some kind of fundamental ‘right to exist’—irrespective of what the temperature is outside, so cities like Montreal, Winnipeg or Moscow must continue to be there, (and grow) by sucking in vast quantities of external energy from somewhere in order to do so. These are good points. And without those fires to socialize around, the poor, homeless and starving in colder areas would freeze to death on short order. Whereas in the warm tropics, they can linger longer. Note to Mr. Gore: Here’s an idea you can use. If people are migrating from the tropics to the temperate zones, it must be because of globbly wobbly, surely. 1/ Conquest and incorporation into the Empire. 3/ Allow entry and re-settle as workers. 4/ Slaughter them, enslaving the best specimens as workers. 5/ Slaughter them all, down to last woman and child.